This year Walt Disney World rolled out the new FastPass+ system. They also rolled out the MagicBand system, which replaces the paper and plastic tickets for families staying on Disney properties. It's alot to absorb and truthfully I was a fan of the old system, which gave families more freedom in the parks and required less pre-park planning. This post is going to focus on the FastPass+ system. Along with setting reservations months in advance for restaurants, you now can set FastPasses as well. You can change your FastPass+ selections as much as you like, even the day you are in the park. But if you travel during a Peak season (Christmas vacation, Spring Break) you need to get on the ball. Popular attractions fill up and Fast Passes for certain days may become unavailable. The days of running to an attraction when the park opens to grab a FastPass for later in the day are long gone. Disney has required us to think and plan really hard. It's not terrible, but it takes some getting used to. Once you've planned a trip to Disney, you need to set up a "My Disney Experience" account. 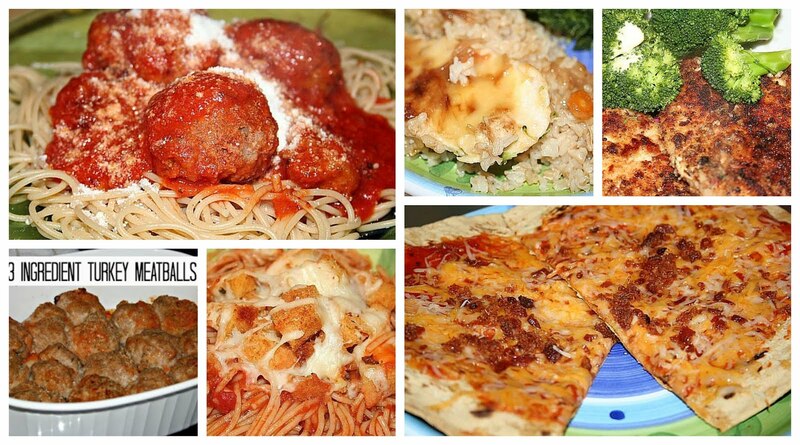 This site is actually one of my favorites, and I recommended having one even before FastPass+ was born. It's a great resource for your trip and links all your confirmation and reservations numbers. Now it also sets your FastPass+ selections. Once you are set up and linked up with all your confirmation numbers you can make an Itinerary. You can go through each day and set your FastPasses. This gets tricky because you'll need to think about what park you will be in every day. Remember to consider all restaurant reservations and other plans. If you are eating dinner in Epcot, and you are without a Park Hopper pass that allows you more than one park a day, you need to be in Epcot that day. When you add a FP+ for a park, the screen will prompt you to pick three attractions. Each person in your party gets three FastPasses/day. THESE CAN BE FOR DIFFERENT ATTRACTIONS! I have kids that don't ride coasters, and I set FastPasses for me to take them on Winnie the Pooh while their dad takes the "big kids" on the Seven Dwarfs Mine Train. When you choose your three attractions, Disney will set up a few suggested itineraries. Select whichever you like best. YOU CAN MODIFY THESE IMMEDIATELY. I don't like to be in the parks in the afternoons. We like to swim at the hotel. I like my FastPasses to be for either when we go back at night or late morning. I modify all my selections to fit my schedule. 1. You need to make an itinerary. Look at park schedules (when they open, what events are in each park) and get an idea of where you want to be each day. Flying by the seat of your vacation pants will cause a headache unless you are so laid back you really don't care about lines and itineraries. God bless you if you can handle that. 2. You can modify FastPass times as much as you like; you can cancel FastPasses and change parks. By downloading the "My Disney Experience" app on your phone you can manage your vacation easily. I recommend making your FastPass+ selections as far in advance as possible to ensure you have a FP for the rides you are interested in the most. FastPasses for some attractions "sell out" for an entire day. They also may have minimal times available which will limit you if you have specific plans and reservations. 3. Avoid setting FastPasses within the first hour of park opening. Lines are minimal and this is just wasting a FP. Save those beauties for midday and evening, when the parks are filled up and the wait times are lengthy. 4. Do some research as to where rides are in the parks. If you aren't familiar with the parks, you can view maps on Disney's website. 5. Don't be afraid of splitting up. If you have a few people who want to ride a coaster, and a few who can't or don't want to, look for rides nearby and set different FastPasses for the same window of time. There is much to know and learn when I comes to Disney. I learn something new every time I go because the parks are always changing. Share any tips below - I'd love to hear them! I honor of Valentine's Day, I'm going to share a very special story. Yesterday I had a wake up call. I was smacked in the face with how blessed I am. Ever since I started working full time I've had moments I feel disappointed. I'm grateful for my job, and as a mom, to be working in a school, there is no better schedule. But even with how much I love being a school secretary I have my moments. I'm not home to style my daughter's hair weekday mornings or to drop off my three younger kids at school. I also lost the job of school pick up to my husband. I admit there was some resentment. Three days of the week, my daughter leaves for gymnastics practice before I even see her face for the day. I don't get my school updates or cuddles before 9pm. Que a tad more resentment. It's easy to miss being home to bring them to school and pick them up, bake and clean and do all the stuff I did before I worked full time. I should pause here and say I get snow days, delays and every school holiday. So I kind of feel like I shouldn't even say I work full time. I work 3/4 time. That's more the truth. Yesterday I had a lengthy conversation with one of our school aides. I've spoken with her before, notably on black Friday at 4am in the bookstore. She was working the register. Obviously this took me a tad by surprise although I know many people work two jobs. And in retail, you work Black Friday. I've done it. I figured she wasn't married because she told me how she works the second job for her benefits since she doesn't get them through the school. She continued to tell me about how many hours she works, how she lives 30 minutes from the bookstore but she needs the second job until the school gives her a position that offers insurance. I'm going to admit I make assumptions about people, and my assumption was that she was single, never married and working two jobs to support herself. Not easy. Last week, this aide came into my office and asked if I wanted to buy a hoagie to support her son's boy scout troop. My mind began spinning. My assumptions were all wrong and suddenly I felt a deep sadness because I know with her schedule she had it a lot tougher than I ever thought a few weeks prior. After more conversation she told me about her son, who is seven. About how they live with her parents since her husband left two years ago. How she went from working three jobs to the two she has, and she sees her son 45 minutes a day during the week. Forty-five minutes. That was a lot to swallow. She picks him up from school, does his homework with him and leaves for the bookstore. She gets home at 10:30pm after he is in bed. She does this Monday through Friday. And she works a full day Saturday. All of this had me thanking my lucky stars that my worries are styling hair before school. I can't even begin to imagine, as a mother, missing my son the way I know she does. Missing all the time with him and the milestones and the special, small moments. She feels blessed to live with her parents because her son is never left with a sitter. But I could see the tears swelling in her eyes when I asked how hard it was to have that kind of schedule. We never know someone else's story. As mothers, we need to support each other and build each other up because we are all doing the best we can. We're all trudging through each day praying our kids are safe and we're not screwing them up. I work with a mother who works two jobs and doesn't put her son to bed five nights a week. She doesn't give him his before bed kisses, and she doesn't even get to make his weekday dinners. Yet every day she comes to work, smiling and working one on one with an autistic child in our system. She follows him, eats with him and calls for help when he runs through the halls. Knowing her has humbled me and made me count my blessings. As I sit here blogging because I'm on a two hour cold delay, I realize how lucky I am. I styled hair this morning. I even made cinnamon rolls. And all I can think is how she got to spend two extra hours with her son this Friday, which makes me smile ear to ear. Mamas, we're a team. Today put away the judgements because that mom that is never at school parties or pickups? She may be living a similar existence to the one I just told you about. And more than anything, these special moms deserve our love and support. Spread love. Be supportive. Hold your snappy comebacks and glares. Make today, and every day, about playing as a team. Find a mama and tell her how awesome she is. You'll make her day. 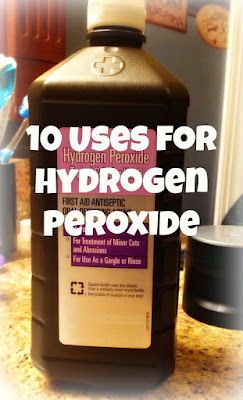 I have always kept a bottle of Hydrgen Peroxide in the house. It resides in our upstairs bathroom, with the nighttime cough medicines and cotton balls. Over the years I have dabbed and poured Hydrogen Peroxide on many cuts and scrapes. But I have also used it to clean ears (my favorite use), whiten clothes, and disinfect toothbrushes. It is non toxic, inexpensive and the world's safest all natural sanitizer! What's not to love? 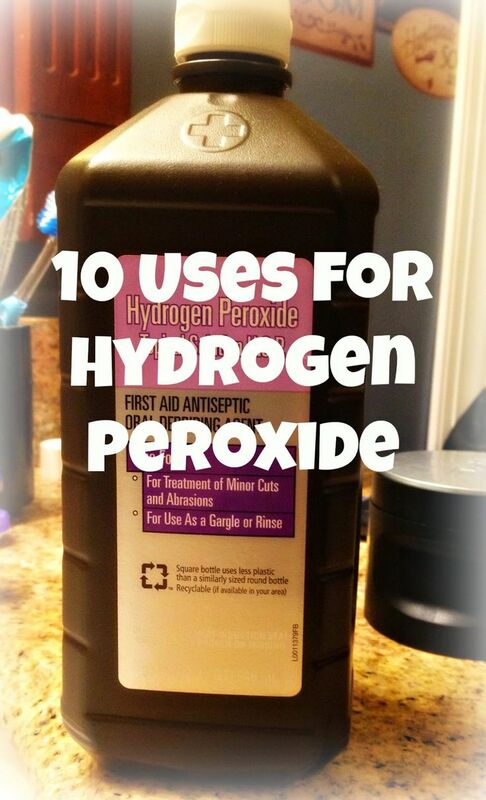 Below are 10 uses for Hydrogen Peroxide. One of my children (who shall remain nameless) could make a candle a day with his/her ears. Sticking a QTIP down the ear only pushes the wax in and makes everything more uncomfortable. Ever since being told by our pediatrician about Hydrogen Peroxide, I have used it to clean all my kids' ears. Just have your child lay flat, on their side, and pour half a capful into the ear. After a few seconds, the Hydrogen Peroxide will start to bubble and fizz and loosen the wax. Let sit for a few minutes while it does it's work. A few minutes later, stick a cotton ball over the ear and have your child turn to the other side dumping the Peroxide. Your cotton ball will be yellow and the ear will be clean! Add a cup of Hydrogen Peroxide to the wash to whiten clothes. It is also great for removing blood stains. Just pour some Peroxide right on the spot and let sit for a few minutes. Wash as usual. Hydrogen Peroxide is fantastic for tooth whitening and even lessens the chances you'll have canker sores. Soak toothbrushes in Hydrogen Peroxide to rid them of germs and all that toothbrushing skank. Hydrogen Peroxide is great for sanitizing your cutting boards, bathrooms and kitchen surfaces. DO not dilute it, and it's best to use it straight from the bottle. My favorite sanitizing secret? Put a spray nozzle on your Peroxide bottle and use it to disinfect the inside of the lunch boxes. If you ever had a mold problem, Hydrogen Peroxide is the perfect cleaning solution. This is an obvious one...but Hydrogen Peroxide is so amazing I almost forgot it! A tablespoon of 3% Hydrogen Peroxide and one cup non-chlorinated water can be used as an effective and safe nasal spray. Dilute 3% Hydrogen Peroxide with water, spray on your hair and comb it through for natural highlights. The change is gradual and you won't get that "bleached out" look. Do you have any Hydrogen Peroxide tricks I missed? Share them! *Disclaimer* I am not a doctor or offering advice on using Hydrogen Peroxide. 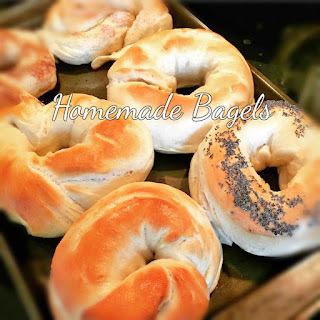 I'm just sharing what I know!